It is better to get rolling with a Roll! Card then to attack your opponent. 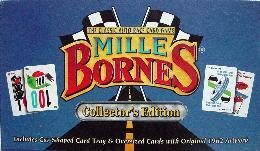 In Mille Bornes, it is best to wait and use your safety cars as Coup Fourres since you get more points and an extra card out into play. However, don’t hang on to them for too long or else you will miss the 100 points for using them as normal. Don’t forget that you can discard your cards. Get rid of your crappy cards as soon as possible, but not in lue of putting miles down. In other words, if you have the Extra Tank card, then the normal gas card has no benefit to you. So when you cannot play mile cards, get rid of the gas card. Counting cards help in this game of Mille Bornes. If you know that all of the flat tires have been played, then you can shed your spare tire cards. If you have a choice, go from high to low in regards to distance. Start off with the 100s, and then move down to the 50s. Keep a 25 in reserve so that you can finish exactly at 1000 (or 700 for a two player game). Watch what your opponent discards. If they keep getting rid of repairs, they most likely have a “Driving Ace”. If you have a safety, then you know that your opponent is susceptible to that avenue of attack.